Tooth pain is the worst, well actually tooth pain with no relief in sight is the worst. Half of the battle is seeking the right kind of help for that problem that you are experiencing. While visiting a dentist is a great place to start, if you need a root canal it is best to trust a specialist. 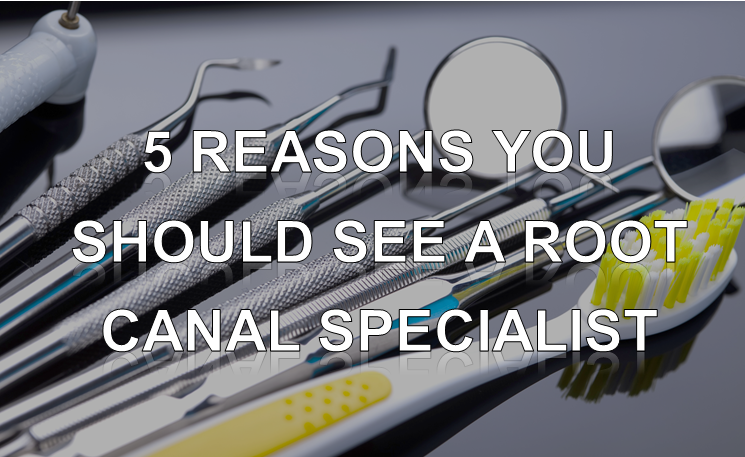 Here are the top 5 reasons why dealing with an endodontist will make your root canal process smoother, and more successful. Get rid of All of the potentially harmful bacteria in your body. The human body is pretty incredible, and powerful. For instance, the bacteria that grows in your mouth can cause a lot of damage if nothing is done to intervene. Not only does it contribute to tooth decay, but that bacteria can also infect the tissue in your mouth, and surprisingly can cause infections in other parts of your body. Thorough cleanings and extractions are needed to successfully remove the bacteria that may be gathered in crevices, between your teeth, or inside of an infected tooth. Less is more? Not in this instance, Endodontists are dental professionals that have gone through the same training as traditional dentists AND several more years of advanced training. If you need a root canal, chances are that you are probably not feeling super comfortable to start with. Endodontists understand the need for emergency service, they know better than anyone what is as stake to leave a diseased or abscessed tooth to continue to grow more infected. Their first concern is your health, well-being and comfort so rest assured that when you seek a specialist your emergency situation will be fixed in no time. Many dentists feel that a tooth must be removed and replaced, however root canals provide the opportunity to save as much of your natural tooth and root system. Looking inside of the tooth gives the specialist an opportunity to assess the severity of the infection/ damage and take action to stop it. While dentists and other dental professionals are surely competent, your oral health and safety is too important to leave to chance. In the event that you do need a root canal, be sure that you go to the most qualified professional. On average dentists see only a few root canals per week where endodontists see upwards of 30 each week. The advanced training and exposure to common complications make for a much better prepared dental professional, decreasing the likelihood that there will be need to have the procedure again in the future. If you are experiencing any mouth or tooth pain, give Copper Creek a call for a FREE consultation today! It’ll be the best money you’ve never spent.